I wanted a "wow" dessert for my husband for Easter week. But I didn't want to invest two days of my life for a few moments of eating (read: homemade puff pastry). Really, it looks like a barracuda feeding frenzy around here on the few occasions we have dessert -- several hours of work can be devoured in a few seconds. 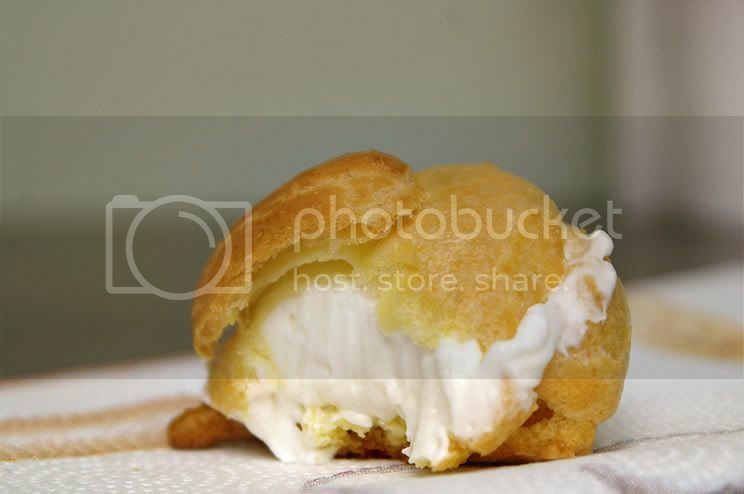 So I set my bar a bit lower and decided on cream puffs. My Better Homes & Gardens cookbook claimed they could be made in about an hour. Perfect. Then I learned, cream puffs, éclairs, and profiteroles all use the same pastry. Three desserts for the price of one! Round (big or small). Filled with sweetened whipped cream and dusted with powdered sugar. Oblong (big or small). 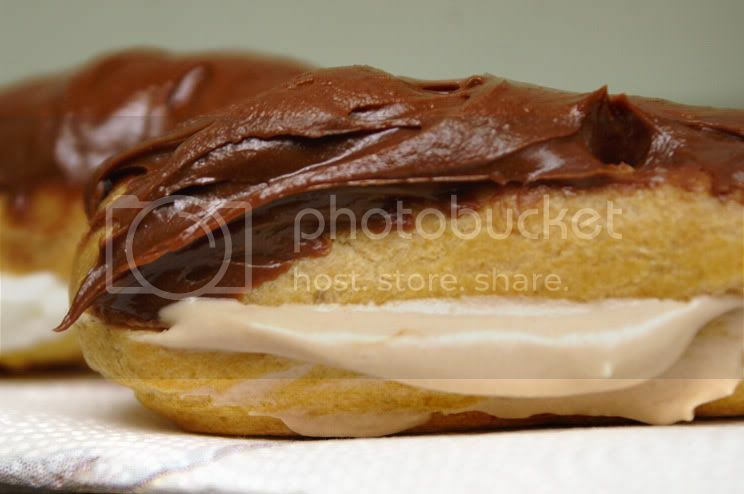 Filled with sweetened whipped cream or vanilla custard and top-coated with a chocolate glaze. My experimental variation: Filled with mocha cream cheese. Round (big or small). Filled with ice cream (any flavor) and served with hot fudge sauce for drizzling. As you can see, they don't need to be perfectly rounded, but they bake up beautifully. 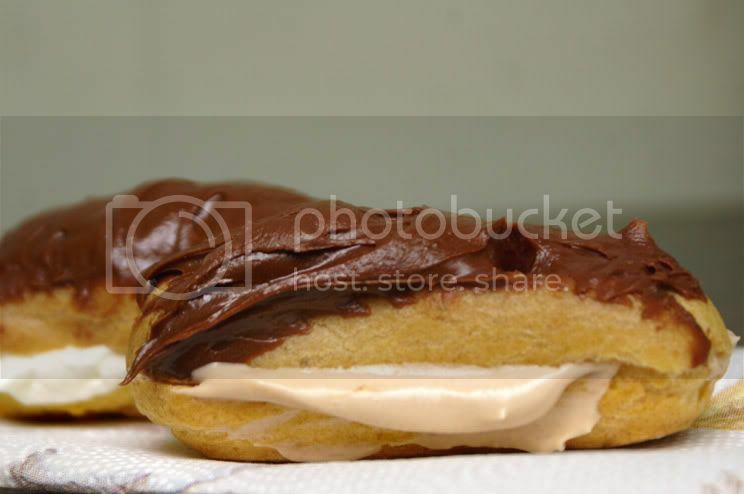 To make the éclair shape, I squeezed them out of a quart sized ziplock with a 1/2 inch snip out of a bottom corner. Eclairs. Why go the graham crackers, canned chocolate frosting, and vanilla instant pudding route when these bakery quality delights can be had for a little extra effort?? And you can even fill them with mocha (chocolate coffee) cream! I thought it would be a bit too gluttonous (even for Easter week) to make profiteroles too, but imagine these babies with ice cream in them, drizzled with hot fudge sauce. Actually I think I felt my middle jelly roll expand when I thought about that. Think broccoli thoughts instead. Source: Better Homes and Gardens cookbook (David Lebovitz of "The Perfect Scoop" fame has another recipe for them that someday I will try. It might be better, but for now these are delicious!). 1. Preheat oven to 400°. Grease a baking sheet (or use a Silpat). In a medium saucepan combine the water, butter, and salt. Bring to a boil. As soon as the butter melts, add flour all at once, stirring vigorously with a wooden spoon. Cook and stir until mixture forms a ball. Remove from heat. Cool for 10 minutes (seriously wait 10 minutes, set a timer). Add eggs 1 at a time, beating until smooth with a wooden spoon after each addition. (FCW note: this is the hardest part. The eggs don't exactly want to get friendly with the dough, but if you persist and show it who is boss, you'll get them to join the party and form a nice smooth shiny dough). 2. For cream puffs and profiteroles: Drop 12 heaping tablespoons of dough (for big rounds) or 30 rounded teaspoons (for mini puffs) onto prepared baking sheet. 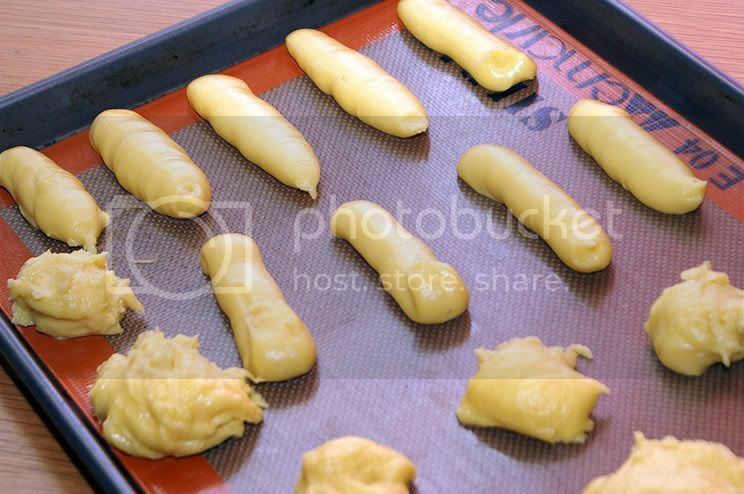 For éclairs: Pipe 12 (for large) or 24 (for mini) strips of dough 3 inches apart (about 4" long, 1" wide and 3/4" high) onto prepared baking sheet. Bake for 30 minutes, turn the oven off and leave them in for 5 more minutes (total of 35 minutes). The puffs should be golden brown and firm. Cool (doesn't take long). 3. Cut tops from puffs, fill with filling. Replace tops (it's easier to chocolate glaze the éclairs before you put the tops back on). 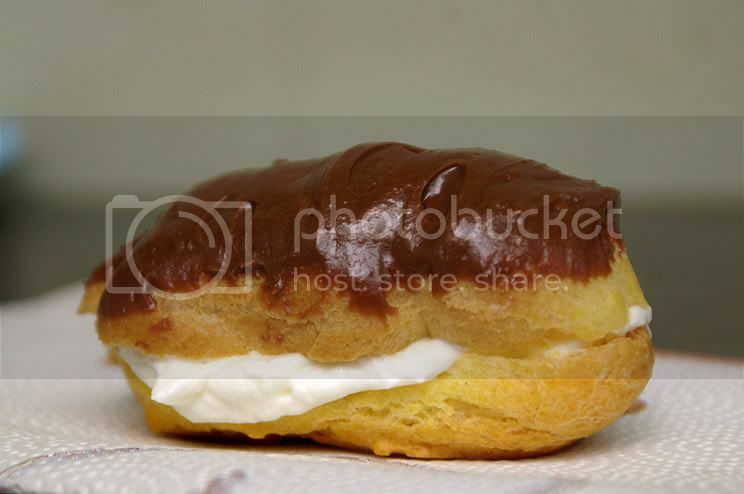 If desired for cream puffs dust with powdered sugar and for éclairs coat with chocolate glaze. These are definitely best eaten the day you make them, but they may be frozen (after being filled) for up to 2 months. The sky is the limit. Butterscotch, chocolate, banana, coconut, vanilla or lemon pudding, homemade custard, any flavor of ice cream. You can even fill them with chicken or tuna salad for a dainty and elegant brunch, tea, or shower dish. Mix marshmallow creme and softened cream cheese together. Fold in sweetened whipped cream. Variations: to make mocha creme, add 1/2-1 tsp. instant coffee granules (careful, too much will make it really bitter) and a big tbsp. of chocolate glaze (see below). Melt chocolate and butter slowly in microwave, stirring after each 20 seconds until melted. Beat in the rest of the ingredients and whip until smooth (add more hot water until you reach the consistency you want). Oh, I love making homemade eclairs, and they're so much easier than you'd think! You can also use the same dough recipe and stir in 1 cup of shredded cheese to make wonderful savory puffs; they're great stuffed with chicken or egg salad. Cheese!! I knew you could go savory with these, but cheese didn't occur to me. Ingenious! The great thing is, they look so easy! Thanks for posting this. They actually are super easy! It's incredible! The additional step of the chocolate glaze makes the eclairs a bit more labor intensive (but nothing like a layered cake), but the cream puffs can be ready to go in no time. I am on my way to your home in Hidden Valley and I am going to EAT these!!! And after that I'm going to have to go to Confession for having such feelings for a pastry!! And after THAT I'm going to have to run 5 miles because just looking at them is putting weight on me. I CAN FEEL IT. I just have to say - thank you for NOT posting this during Lent! :-) I hope that I can make these someday soon! I didn't know it was possible to ingest calories by inhaling, but I smelled them and stepped on the scale and had gained two pounds. Mm hm. They are surprisingly easy, aren't they? What a great story! I can't wait for the next shower I go to so I can bring some savory puffs :). wow! they look good! Even though mu husband is NOT a dessert person I will have to try them -- I may be putting on much weight if I can't get him to eat them!! I have a question though-do these rise or the size you make them is the size they are? 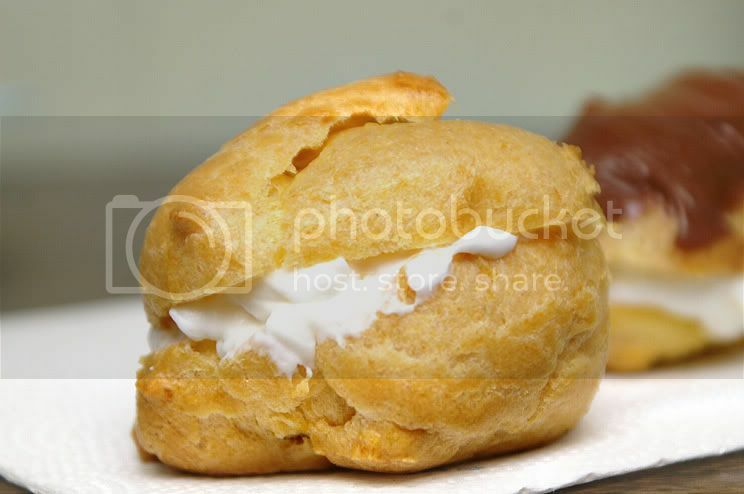 We fill our cream puffs with cornstarch pudding instead..so yummy!! Oh they definitely rise as they bake -- I'd say they at least double (in height), and some of the rounds (though not the eclairs) almost tripled! They were good! :) mu husband raised his eyebrows and politely said they were nice when i put cream and chocolate on them, but it was obvious he was only saying so for my sake, but i put ham, cheeses, tomato and mustard and it suddenly became really good! hehe! why are so many men more savoury than sweet people?? guess it keeps mychocolate safe... :) thank you! Glad the savory ones went off well :-D. Thanks for reporting back!